Referring providers, please click here. 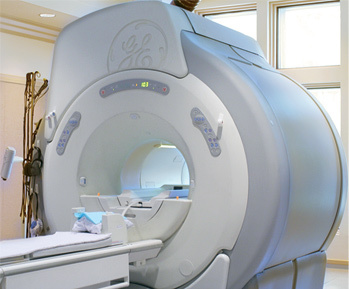 Our 1.5 Tesla High Field, Short Bore GE with MRI technology is notable for providing diagnostically superior images when compared to other units. Call for same or next day scheduling. MRI: A fast, simple examination Magnetic Resonance Imaging (MRI) is a safe, totally painless way for your physician to look into your body without radiation or x-rays. The pictures created during the exam provide sophisticated soft tissue images that can improve the diagnosis. An x-ray utilizes radiation to look at the bones. An MRI is a way to look into the body without x-rays and provide much more detailed information of the nerves, muscles, ligaments, and tendons. The exam uses radiofrequency and a magnetic field to create soft tissue images of the body. You will be asked to lie on a sliding table and the technologist will position you comfortably. You will be asked to remain still during the examination. Nothing! Just lie on the table and relax. Depending on the type of exam you are having, the exam will take approximately 30 to 90 minutes. You will be provided with ear protection to wear during the exam to protect your ears from the loud acoustic noise produced by the magnetic field gradient. An audible sound, perceived as a click, buzz, chirp, or knocking, can be heard during the exam. Sometimes; if your physician feels it is necessary. You will know about any injections before your scheduled exam as prior lab work may be required. You can eat, drink, and take regularly prescribed medications prior to the exam. If you will be having a leg exam, you can bring shorts to wear. Otherwise you may be asked to change into a hospital gown to avoid any possibility of interference from metal in zippers and fasteners. Your doctor or the MRI technologist will answer any questions you may have or please call Seacoast Orthopedics & Sports Medicine at (603) 742-2007.